Hookah Tobacco comes in many different flavors, sizes, shapes, and brands, but picking out a specific size of hookah shisha is very important in the selection process. 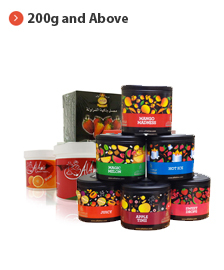 Hookah Tobacco typically comes packaged in 50g sample packs or in larger containers. Sample packs are ideal when trying an assortment of shisha tobacco flavors. Larger containers of Flavored Tobacco are recommended for larger groups or users that know which flavors are preferred and smoke several times per month.